So it was an interesting weekend. And now it's turned into an interesting morning. Where to start? The beginning, I guess. So Friday night was amazing. Such fun. Varen, Loulou & I went to the Cool Runnings in Fourways for the 2007 SA Blog Awards. We got to meet loads of other bloggers in the flesh. I must say it is a rather strange order of events, you get to know these people so well by reading about the minute details of their lives and yet you still have no idea what they look like or, usually, how old they are. So after quite a few drinks and the actual awards ceremony (I lost to Steve Hofmeyr, I am devastated!) we started wandering around asking everyone what their blog name was ... it's hard to tell who the person behind the blog might actually be, I guess it's like going to a masquerade ball without the masks. I got to meet Phlippy, Peas, Champagne Heathen, Jam and ChewTheCud. It was fab, it is always nice to meet new people in Jhb :) People say that the folks in Jhb are so much more friendly than in Cape Town, but I've never thought so ... perhaps because I've never really (till now) had to make that much of an effort myself since I had a ready-made group in the form of Bean's friends, which is clearly useless to me these days. After that, the three of us headed out to Say What! in Sunninghill to meet up with Phlippy and some mates of his. And then we ended off the evening with a little foosball at a dodgy pub round the corner from home. Varen ended up staying over ... too much alcohol and too late a morning meant driving was not an option. Which was nice because we got to have breakfast on Saturday morning at Doppio Zero, where I dutifully had my all-time favourite breakfast, the Eggs Napoli :) Then he followed me around while I did my shopping. Which was nice. It's weird how you can enjoy someone's company when doing the littlest things. Then he dropped me back at home and went to get the rest of his stuff ready for his move on Sunday. I went out and did some more shopping ... needed some new boots for the upcoming winter. That evening we had decided to watch 300. Prepare for glory! 300 is an adaptation of Frank Miller's epic graphic novel. 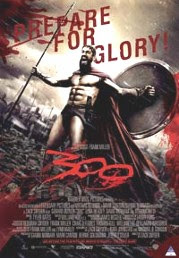 Using hyper-real renderings similar to Miller's own graphically stylized illustrations, the film tells the true story of 300 elite Spartan warriors led by their fearless king Leonidas (Butler), who thwart the charge of Xerxes and his massive Persian army at the battle of Thermopylae. Facing insurmountable odds, their valor and sacrifice inspire all of Greece to unite against their Persian foe, leading to the origins of democracy. I thought it was rubbish. Just another Troy, but with no-name brand actors - the leading lady looked like Brooke Shields but sounded like Keira Knightley, if you can imagine? And the storyline was fairly weak, couldn't apply logic to any of it. Which is generally fine, but then admit that you're making a fantasy story. I did like the colour-washing they did tho :) Otherwise, average. Watch it if you must. Saturday evening didn't go very well between Varen & I. I'm not sure if was just an overdose of seeing each other or a purely mood thing ... he'd booked tickets for the wrong day online and so we had to queue and end up sitting in the second row from the front and we had to grab a quick food-court dinner. So on Sunday I had to go back to Bean's, luckily he'd moved out already, and fetch my fish-pond from the garden. I thought we'd leave it there, but he was going to get rid of it if I didn't take it. Yet another example of something I put effort into that he never gave a second glance to. Which left it in rather a state when I saw it for the first time in months ... forget fish-pond, think stagnant body of water. It took ages for me to clean it out, catch the fishies (2 had managed to survive, miraculously! ), get the whole shebang into my car and back to the place I share with Loulou. I've included a pic of how it looked when I first got it. It looked quite different on Sunday. So that was exhausting work. After relaxing for just a little I headed over to Sal&Bru's for a Sunday braai. Varen and I had briefly mentioned possibly doing something in the afternoon after his move, but I hadn't heard from him yet. Plus after Saturday evening I thought we needed a little space. The afternoon was fabulous with lots of really great people and it was just what I needed, even tho all the happy couples highlighted my own unstable state. Was exhausted when I got home at about 7:30 and proceeded to spend the rest of the evening in bed watching DH 2. And now it is today. And it appears Varen and I are over again. Which is fair enough. Somehow whenever I've ended up thinking I should end it and let him off the hook for putting up with my chaos, he gets in there first and I fight for him to stay. Weird. So this morning when he called I decided I was done fighting for this crazy set-up that passes for a relationship. He's been fabulous to put up with all the ups and downs that I've put him thru. He has jumped thru any number of hoops to try to make this work. I on the other hand, can not give him what he wants, needs or deserves ... at least not at this point. I wish I could let him plan the wonderful romantic weekends in advance, but i can't think that far ahead right now. How do you explain to someone that if you don't really like yourself right now, there's no way you could believe that they could really love you. Even if they do. It'll be painful and he'll be angry and I'll go back to being numb and we'll both get over it. And hopefully one day he'll even speak to me again :) Hopefully. Funny how I seem to be getting used to this chaos, it hardly seems to cause a blink anymore, just a mild sense of loss ... that can't be good. Call me emotionally unstable. i'm so, so sorry i couldn't fight for us anymore. i truly hope you find the peace your looking for. you are an amazing woman philly. thank-you for all the time and effort you gave willingly to try and turn this into the relationship you dreamed it would be. And I'm truly sorry I messed with that plan :( but it couldn't have been any other way. Sorry girl, it happens though. When we are out of that space it i great. @phlippy - yeah, it's not nice, but i guess it's just a part of life. thats my alter-kitty! 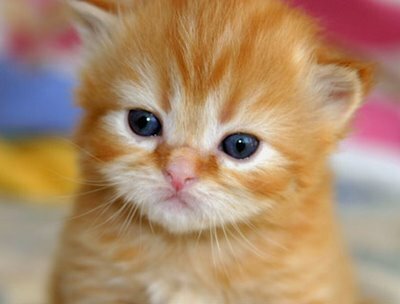 If I was a kitten, thats what I'd look like! @cud - fabulous, everyone should have one of those ;) I wonder what I'd look like if I were a kitten ... ?